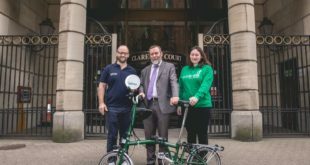 A panel of experts, including officials from the Sentencing Council, are this Friday to debate the leniency surrounding sentences handed down to drivers involved in collisions with cyclists and pedestrains. With the goal to tackle the well documented lack of appropriate sentencing apparent in the courts, the debate is particularly timely given the Government’s recent announcement of a comprehensive review of driving offences and penalties, including a proposed new offence of ‘causing serious injury whilst disqualified, unlicensed or uninsured’. The debate will also touch on victim blaming, with many cases having touched on the irrellevence of whether or not a cyclist was wearing a helmet when struck by a vehicle. The public will be able to engage with the debate via the CTCdebate hashtag on Twitter, as well as via a live stream, available on request with an email to Jacqui.shannon@ctc.org.uk. For those watching live, the debate runs 9 to 11am. The CTC campaign centres on three changes; improvements to roads policing, including a more thorough crime scene investigation, a more considered approach to charging and prosecution, with sentences that reflect the severity of an offence and ultimately discourage bad driving. As part of its evidence to be tabled, the CTC has collected over 4,000 reports of dangerous driving which have resulted in unsatisfactory conclusions in court. – Katy Waterman, Senior Policy Advisor at the Crown Prosecution Service Strategy and Policy Directorate. – Driving bans as a percentage of convictions for dangerous driving have gone down for a third consecutive year, from 92% in 2011 to 89% in 2013. Since 2009, there has been a 6% drop in the number of bans given for dangerous driving convictions. – The number of lifetime bans given for dangerous driving convictions has gone down for a third consecutive year, from nine in 2011 to two in 2013. – The percentage of bans for dangerous driving that were between one and three years in duration fell slightly to 41% in 2013 compared to 44% in 2012, but the percentage of bans imposed only until the driving test was passed rose from 53% in 2012 to 58% in 2013 (it was 46% in 2011). – The percentage of bans for dangerous driving that lasted between five and ten years dropped slightly from 1.1% in 2012 to 0.8% in 2013. – The average fine given for dangerous driving in the Crown Courts fell by more than a half, from £782 in 2012 to £380 in 2013. – The percentage of drivers convicted of careless driving who received a ban increased slightly from 5% in 2012 to 6% in 2013, whilst the percentage of bans that were for six months or less also increased, from 66% in 2012 to 69% in 2013. – The total number of prosecutions for causing death by dangerous driving fell again. There has been a 35% drop in the number of prosecutions for this offence since 2007. – The total number of prosecutions for causing death by careless driving remained unchanged, but has dropped by 10% since 2010.